From long-standing worries regarding the use of lead and asbestos to recent research into carcinogenic issues related to the use of plastics in construction, there is growing concern regarding the potential toxic effects of building materials on health. Toxicity of building materials provides an essential guide to this important problem and its solutions. Beginning with an overview of the material types and potential health hazards presented by building materials, the book goes on to consider key plastic materials. Materials responsible for formaldehyde and volatile organic compound emissions, as well as semi-volatile organic compounds, are then explored in depth, before a review of wood preservatives and mineral fibre-based building materials. Issues related to the use of radioactive materials and materials that release toxic fumes during burning are the focus of subsequent chapters, followed by discussion of the range of heavy metals, materials prone to mould growth, and antimicrobials. Finally, Toxicity of building materials concludes by considering the potential hazards posed by waste based/recycled building materials, and the toxicity of nanoparticles. 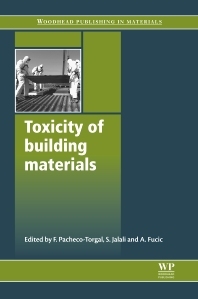 With its distinguished editors and international team of expert contributors, Toxicity of building materials is an invaluable tool for all civil engineers, materials researchers, scientists and educators working in the field of building materials. Said Jalali is former Professor of Civil Engineering at the University of Minho, and is an acknowledged expert on building materials. Dr. Aleksandra Fucic has 30 years of experience working on the biomonitoring of populations exposed to radiation or chemical agents with a special interest in achieving a healthy living environment and investigation of health risks related to new construction materials.